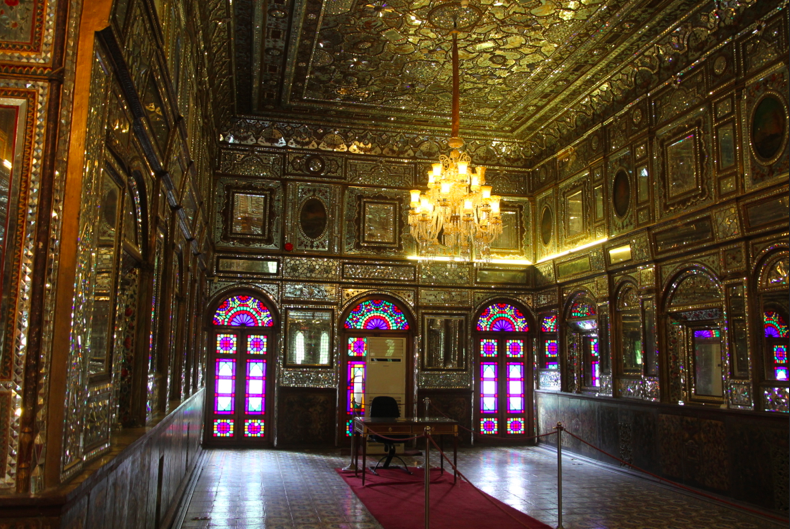 Golestan Palace—Tehran’s crown even has a royal tent building | Where to next? Tehran is overrun with palaces, but the showpiece has to be the Golestan complex of palaces, museums and halls near the centre of town. Surrounded by an ancient wall, this combination of buildings, mirrors, stained glass, tiles, mosaics, marbles, woodcarvings, enamels, gardens, fountains and more is the city’s oldest monument. Poor John and I spent almost half a day exploring Golestan’s lush gardens and lavish buildings. They have a cunning, money-making admission system. We paid 150,000 rials (better known as 15 tomans) or about $5 to get in. Then we paid an extra 50,000 rials per individual building we wanted to visit. There’s a big map to choose from, but the lack of explanation makes it hard to pick. Luckily, we only had to specify a number of buildings and not give exact names. In the end, a local guide standing near the ticket counter suggested which buildings to skip, so we bought tickets to visit five of the nine on offer. 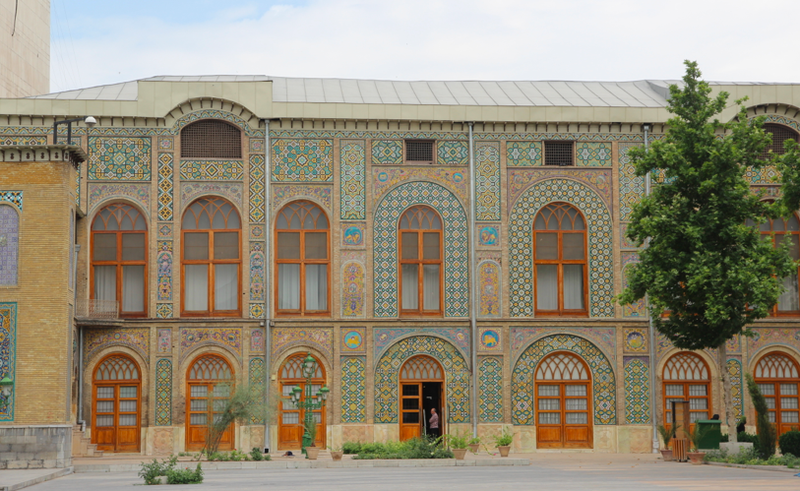 Golestan Palace is one of the buildings that made up the city’s historic citadel (Arg), which was built in the 1500s. In the late 1770s, the palace became the official residence and seat of government for the royal Qājār family. 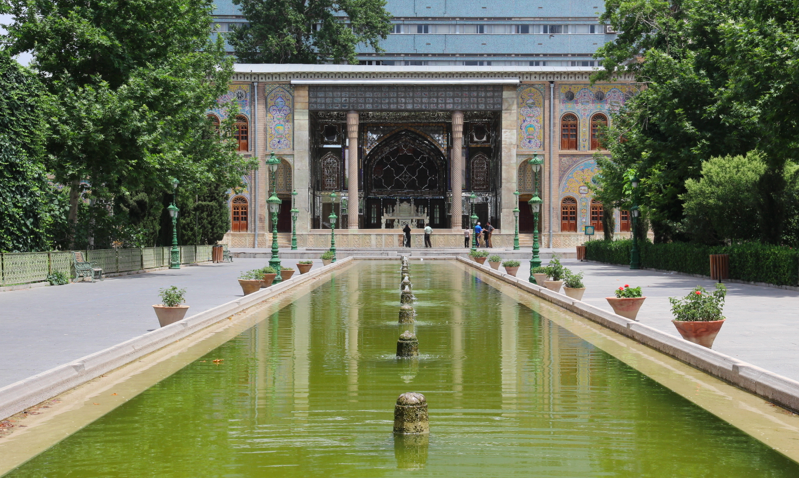 In 1865, Haji Abol-hasan Mimar Navai had it rebuilt in its present form. The palace’s most characteristics features and rich ornamentation date from the 19th century. 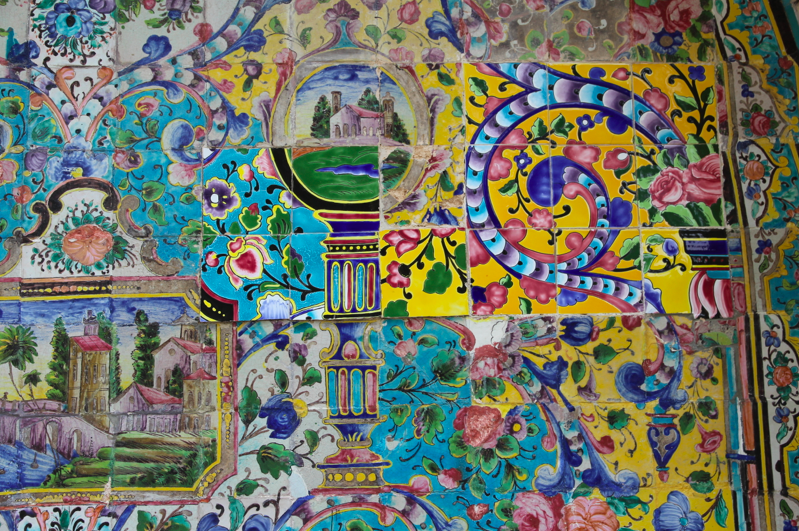 They incorporate traditional Persian arts and crafts as well as elements of 18th century European motifs and styles. In addition to being used as the governing base of the Qājāri kings, the palace also functioned as a recreational and residential compound and a centre of artistic production during the 19th century. During the reign of the Pahlavi dynasty (1925–79), the palace was used for coronations and formal royal receptions. 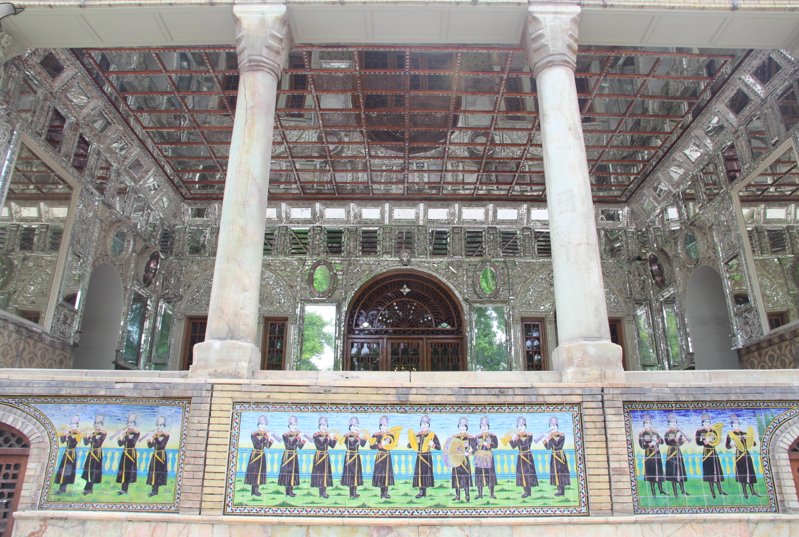 The family built their own formal residence at Niavaran. In fact, Reza Khan (Pahlavi senior who reigned from 1925–41) had much of Golestan demolished because he thought the old structures might stand in the way of modernisation. Such a pity he felt that way. After all, his coronation was in the famed Takht-e-Marmar, or Marble Throne. Built more than 200 years ago, the Takht-e-Marmar and its surrounding terrace are adorned by paintings, marble carvings, tile work, stucco, woodcarvings, enamels and lattices. The actual throne sits in the middle of the terrace and is made from yellow marble from the Yazd province. It was designed and created by the Qājār court’s main painter and several master artists. 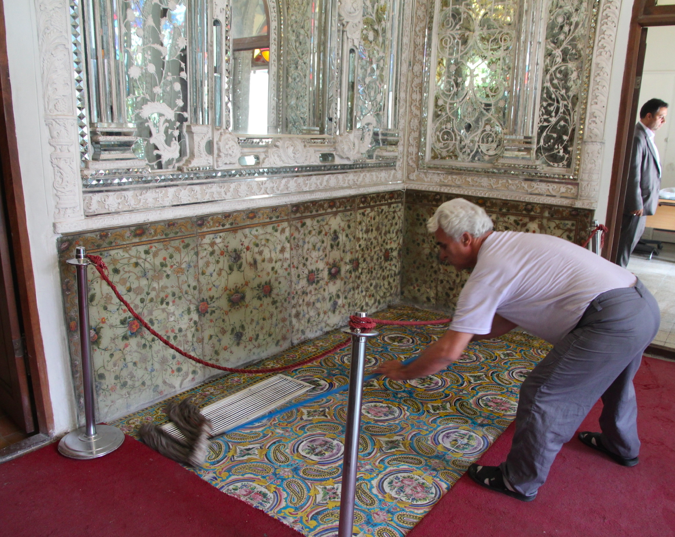 It is said to include 65 pieces of marble. The Shamsolemārah, or the Building of Sun, is considered the complex’s most significant and beautiful structure. The ruler Nassereddinshāh had seen pictures of multi-storey buildings in Europe and decided he had to have his own. The Shamsolemārah’s two tall towers made it Central Asia’s first ‘skyscraper’. Then there’s the Karimkhān’s Sanctum, a verandah with three arches and a small marble throne. This was supposedly a favourite spot for Nassereddinshāh, and where he spent private time smoking his hookah. His tombstone is here. Given that we are camping most of the way from Tehran to Beijing, I was rather taken by the Chādorkhāneh, or warehouse for royal tents during the Qājār period. Apparently, Qājār clan members loved the great outdoors and living in tents. I bet they loved having their servants trot along to put up the tents and cook and serve meals. But the Wind Breaker (wind catcher) Building is certainly one of my favourites. 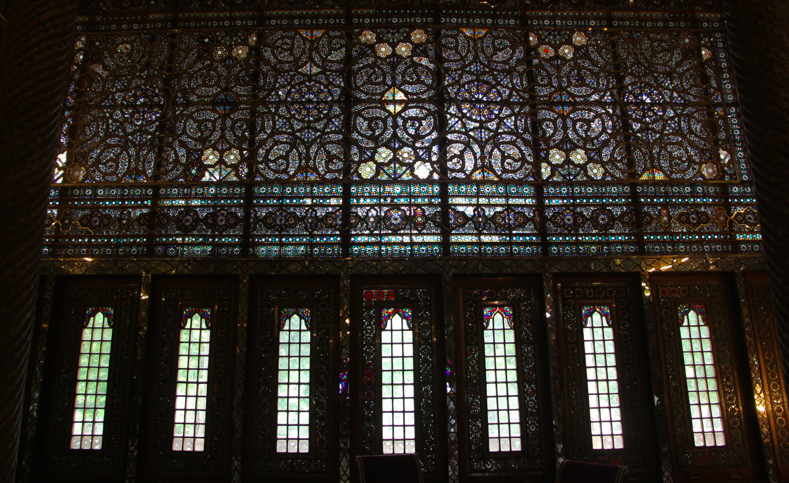 Also known as Emarat-e Bagdir, this was the second structure in the Golestan Palace complex. The four wind catchers that rise overhead capture the breeze, making the building cool during the hottest months of the year. But I like it because it’s just so darn beautiful. I could have wandered in the darkened rooms for the rest of the day. A final stop was in the Mirror Hall. Photos aren’t allowed, but an iPhone on silent works wonders. I reckon the guard knew what I was up to, so I limited my bad behaviour to a couple of snaps. P.S. Many thanks to the webmaven for telling people our news until we could get online again. These are magnificent! I think that, like you, I could stay in the Wind Breaker all day but what a privilege to see five of nine. Thank you, as always, for letting me live vicariously through you and for sharing your wonderful photos. Oh, and I’m still waiting for John’s before haircut shot. I guess that, now that you have Internet access, you’ll be able to send it soon. Private email coming while you have access. I love the Wind Breaker too. And it was so cool inside. As for the before shot, I’ll have to see if I took one. G’day how AWE INSPIRING and magnificent Peggy! Thanks for sharing!! I would be lost in the architecture and history for days! It really is amazing to see in person. And like you, I felt lost in the architecture and history. Dear Mrs Leggy Peggy, All these wonderful places and things you see! How come the world is in such a mess. The Sunnis v the Shiites. The Catholics v the Protestants. If there was some way that everyone could read your blog we would all be better off. Thank you suchled. Only pockets of the world are such a mess. I wish the media wouldn’t paint such a dark picture of so many places, and that people could see for themselves how peaceful much of the world really is. One day I am going to see all these places as well..next? These are beautiful pictures, and writing to match! I have seen the “pay-per-room” scheme in other countries, although it looks like here, it was worth the annoyance. Good luck on your next adventure, where ever it takes you! Peggy your travels are so inspiring and make me want to go to each and every spot. There’s almost always a spare seat on our travels. I’ll keep you posted. That’s a perfect description. The buildings really do look like huge jewels. Wow they all look so dazzling! I wouldn’t know where to look first, or after that. Thank you for sharing this gem! You’re right, we hardly knew where to look next. Almost impossible to take in on one visit, but we did our best. I rather suspect the royals never tired of the lavishness because they certainly kept it going for decade after decade. Maybe they just wanted it, but never really looked at it, but I reckon they doted on it and on themselves.